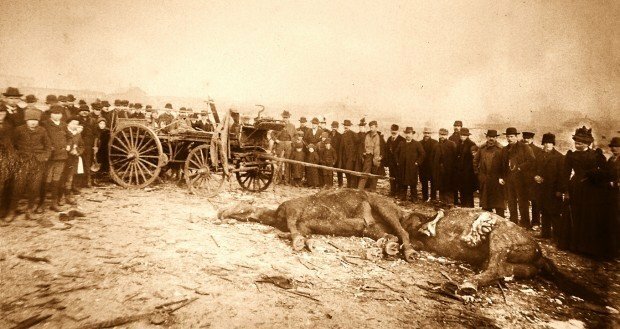 A crowd gathers around a hook and ladder wagon and two fire department horses killed in the explosion in 1895 at the Kenyon-Connell Warehouse. Butte Archives Photo. 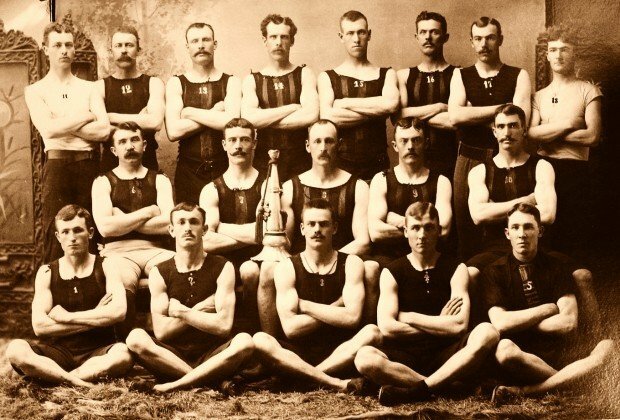 Pictured in the champion hook and ladder team photo prior to 1895 are Jack Flannery, third from the left in the front row. He escaped certain death when the building exploded because he was attaching a fire hose to a hydrant. Tom Burns, second row end, George Fifer, top row left, and John Sloan, middle of the top row were all killed fighting the fire in the Kenyon-Connell warehouse. 9:55 p.m. when he noticed smoke coming from a warehouse near Arizona Street. Men from the Butte Fire Department — located in Butte’s old City Hall on Broadway — quickly loaded up the horse-drawn ladder wagon and rushed to the scene. Less than 12 minutes later most of these men would be blown to pieces. explosion remains the deadliest disaster for the Butte Fire Department. The 13 firefighters who died on that frosty evening of Jan. 15, 1895, will be honored as part of the International Association of Fire Fighters Motorcycle Group rally, which runs Monday through Thursday in Butte. Rick Ryan, Butte battalion chief, said one reason the national organization chose to have its annual rally in Butte is to show respect for the firefighters lost on that tragic evening. “Nearly the entire fire department was wiped out in that explosion,” Ryan said. to arrive at the scene immediately attacked the dynamite-fueled fire, which was burning inside the warehouse. Assistant Chief Jack Flannery said the building’s metal siding glowed red-hot from the extreme heat. Flannery’s job was to attach the fire hose to the plug several yards from the burning warehouse. This would ultimately save his life. While he worked on the plug, his fellow firefighters ran into the teeth of death. survivors, a second explosion occurred at the nearby Butte Hardware Co. warehouse. “Human bodies lay piled two deep; some writhing and moaning in their dying agonies, but the great number were silent forever,” he wrote. Butte’s current battalion chief John Paull has researched the deadly blast over the past few years. As a longtime firefighter, Paull said he’s always had a connection to this disaster. These men could never have expected such an incredible explosion. Paull said there were reports at the time that the blast was heard from as far away as Willow Creek and Three Forks. Debris was found more than four miles from the blast scene. Several spectators were killed or wounded by bits of flaming debris that shot from the blast site. Paull noted that the warehouses stored hundreds of 6-inch by 4-inch iron blocks that were used as skimming tools in the smelter. In the giant blast, these “rabble heads” became deadly rockets. “These were like pieces of shrapnel flying everywhere,” Paull said. One of these rabble heads was found imbedded in the roof of the Silver Bow Club building on Granite Street, more than a mile from the warehouse. Investigators determined the warehouse owners were negligent for the disaster, because they stored more dynamite in the warehouses than was allowed by law. The limit was 100 pounds. Paull said officials suspect there may have been as many as two railroad cars loaded with the explosives in the warehouses that night. — Reporter John Grant Emeigh may be reached via email at john.emeigh@lee.net or phone at 496-5511. Follow him at Twitter.com/@johnemeigh.